Hey! 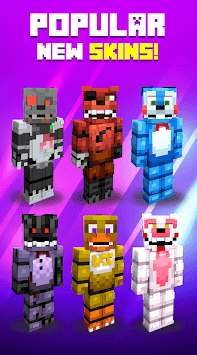 Get new Animatronic Skins for Minecraft for free and show how fabulous you are in minecraft online multiplayer! Install your favourite style of Animatronic skins and customizable dynamic live skin with fun in Minecraft PE (MCPE) creative mode theme. 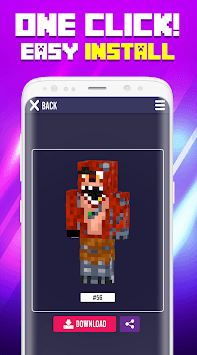 If you are one of the biggest Minecraft fan and you are looking for the awesome app for your new minecraft Animatronic skin, This app is make it for you! 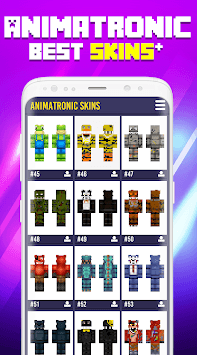 Our collections Animatronic skins including scary FNAF, Animatronic, boys, baby boy, baby girl, cute skins, princess, swimsuit, bikini, queen, blogger, monster ,super hero, superheroes, mob, herobrine, angel, enderman, girl with ear skins, mermaid, robot skins, cape skins, youtuber skins , teen, noob skins, creepypasta, kawaii skins, vampire skins, zombie, mob, ben 10, assasin skins, beast, daily skins, free skins, popular and very rare skins much more! Skins Animatronic for minecraft is superb collection , you can easily browse your favorite character and install in one click! All Animatronic skins are very easy to download cause it sort by the number. And then you just launch Minecraft and choose skin you just download. Compatible with mods and addons! Within instantly, you could be playing with a new, really awesome skin! Skins even work in multiplayer and work perfectly with all mods and addons. Easy? If you want to see what you need in Animatronic skins next version, please write comments, We will add them with our new update!